Oil on canvas, 122 x 217 cm. William Scharff found a predecessor to the Modernist idiom of his own time in the art of the Renaissance painter Paolo Uccello. He was intrigued by the almost Cubist appearance of Uccello’s geometric compositional forms as well as his use of dynamic movement patterns as a precursor of Italian Futurism. 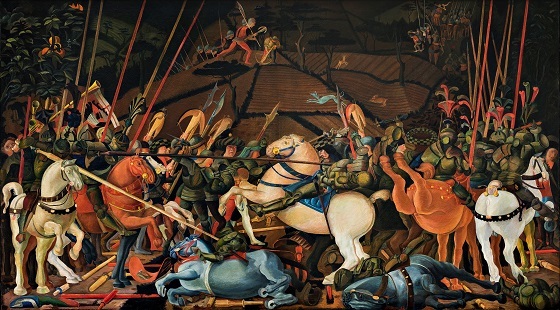 The Dane’s fascination with the Italian painter led to his fantasy of Uccello’s The Battle of San Romano, which depicts the battle between Florentine and Sienese mercenaries in 1432. What particularly distinguishes the original from this work is the intense colour treatment that Scharff’s version is characterised by.